This report describes the findings from an online mapping of the populist right and right-wing extremism in Europe. By online mapping is meant a picture of the right according to the web. We describe in some detail what the web is able to tell us about what we phrase right-wing formations online, that is, both the populist right as well as the extremists, in one mapping per country: Austria, Germany, Greece, Hungary, Netherlands, Belgium, Italy, Denmark, Norway, France, Spain, Bulgaria and Serbia. Our analysis also includes crossovers, i.e., which groups or other entities are recognized in more than one country. For example, is there a European hub organization? Or are there particular links between right-wing groups across countries? 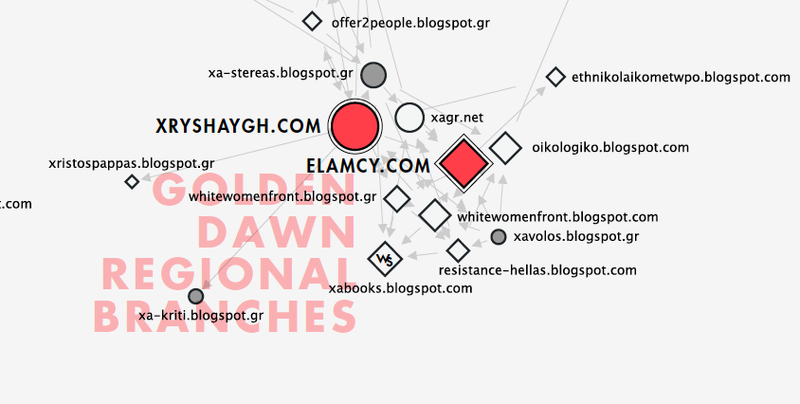 Our ‘maps’ are cluster graphs of websites linked to and from by the right, generated by the Issue Crawler software. The maps are accompanied by descriptions of the qualities of each of the networks as a whole, the individual clusters, and the top nodes per cluster. Which types of networks do the right form, if any? Are the populists linked to the extremists? Are the extremists united, or splintered? Are they national, regional and/or international? Are they fresh, and active, also in social media? We are also interested in the substance of these networks. What is the populist right and right-wing extremism about, at least according to the websites? What are their issues? What kinds of activities do they undertake? We also have two focal points. One focus is on the lone wolves, or as we have interpreted them, also the lone bloggers. A second point is youth recruitment. We are particularly interested in outreach activities, and the youth culture of the right. Ultimately we are concerned with the counter-measures. How is the right being countered, at least according to the web (and on the web)? Do the counter-measures address the activities of the right? Here we make a series of in-country observations, recommending for example efforts to take back the yurt in Hungary, and the organic food markets and blood drives in Greece. There are also mismatches. In Austria the counter-measures network concentrates on 'brown' culture (neo-nazi symbols and lifestyle), whereas the populist issues are less addressed. In the Netherlands there is a similar phenomenon, however much the anti-extremism measures (e.g., independent monitoring initiatives) are now in decline, and have not as of yet been replaced by anti-populism undertakings. Finally we have found the newer the movement, the newer the media used. The counter-jihadists, largely located in northern Europe, the identitarians (of France), and the new right populists have moved to social media, with the populists preferring Twitter (as broadcast medium) and the counter-jihadists (and to an extent the identitarians) Facebook. With the use of the open web in decline across the far right spectrum, further research is recommended with respect to the use of social media by the new right.